2Property crime has declined significantly over the long term. Like the violent crime rate, the U.S. property crime rate today is far below its peak level. FBI data show that the rate fell by 50% between 1993 and 2017, while BJS reports a decline of 69% during that span. Property crime includes offenses such as burglary, theft and motor vehicle theft, and it is generally far more common than violent crime. 3Public perceptions about crime in the U.S. often don’t align with the data. Opinion surveys regularly find that Americans believe crime is up nationally, even when the data show it is down. 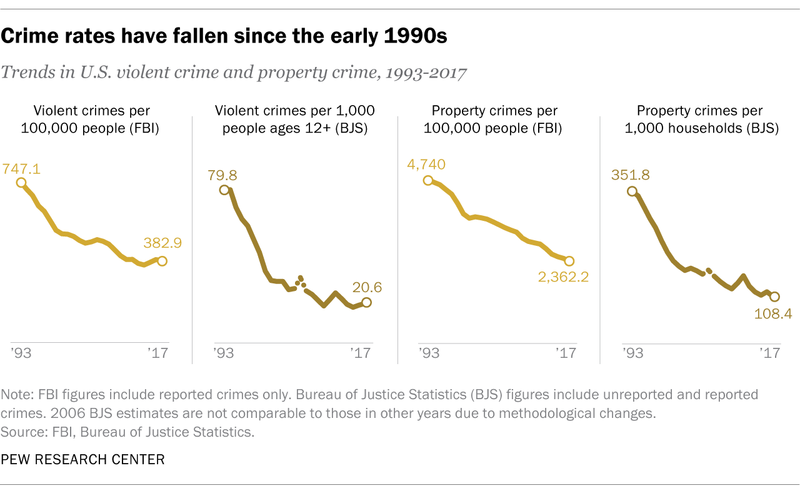 In 18 of 22 Gallup surveys since 1993 that have asked about national crime, at least six-in-ten Americans said there was more crime in the U.S. compared with the year before, despite the generally downward trend in national violent and property crime rates during most of that period. Pew Research Center surveys have found a similar pattern. In a survey in late 2016, 57% of registered voters said crime in the U.S. had gotten worse since 2008, even though FBI and BJS data show that violent and property crime rates declined by double-digit percentages during that span. While perceptions of rising crime at the national level are common, fewer Americans tend to say crime is up when asked about the local level. 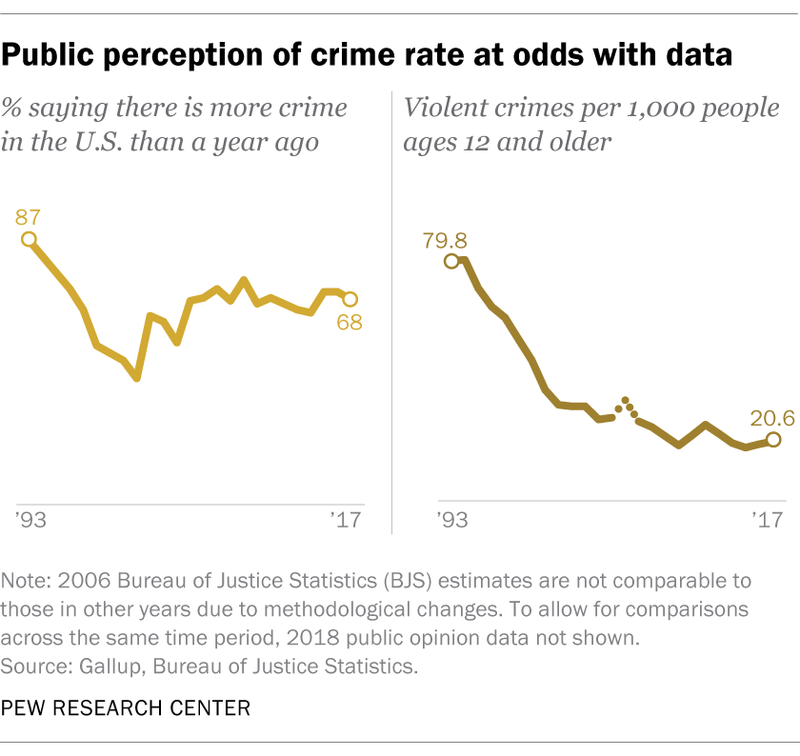 In all 21 Gallup surveys that have included the question since 1996, no more than about half of Americans have said crime is up in their area compared with the year before. 4There are large geographic variations in crime rates. The BJS data don’t allow for specific geographic comparisons, but the FBI data show big differences from state to state and city to city. In 2017, there were more than 600 violent crimes per 100,000 residents in Alaska, New Mexico and Tennessee. By contrast, Maine, New Hampshire and Vermont had rates below 200 violent crimes per 100,000 residents. And while Chicago has drawn widespread attention for its soaring murder total in recent years, its murder rate in 2017 – 24.1 murders and non-negligent manslaughters per 100,000 residents – was less than half of the rates in St. Louis (66.1 per 100,000) and Baltimore (55.8 per 100,000). The FBI notes that various factors might influence a particular area’s crime rate, including its population density and economic conditions. 5Most crimes are not reported to police, and most reported crimes are not solved. In its annual survey, BJS asks victims of crime whether they reported that crime to police. In 2017, only 45% of violent crimes tracked by BJS were reported to police. And in the much more common category of property crime, only about a third (36%) were reported. There are a variety of reasons crime might not be reported, including a feeling that police “would not or could not do anything to help” or that the crime is “a personal issue or too trivial to report,” according to BJS. Most of the crimes that are reported to police, meanwhile, are not solved, at least based on an FBI measure known as the “clearance rate.” That’s the share of cases each year that are closed, or “cleared,” through the arrest, charging and referral of a suspect for prosecution (or through “exceptional means,” such as the death of a suspect or a victim’s refusal to cooperate with a prosecution). In 2017, police nationwide cleared 46% of violent crimes that were reported to them. For property crimes, the national clearance rate was 18%. Note: This is an update of a post originally published Feb. 21, 2017.